Boil Bhendi pieces in Tamarind juice and add haldi,after boiling and the pieces turn tender add Salt and switch it Off after 2 mins.Let it cool. Place Kadai on the Stove and add Oil,keep Medium Flame,after its heated add Urad Daal,Red chillie slits,and saute for a minute.Then add Curry leaves and Hing , and add the boiled Bhendi pieces to the Kadai.Turn Stove to low flame and after 2 to 3 mins Switch it off. 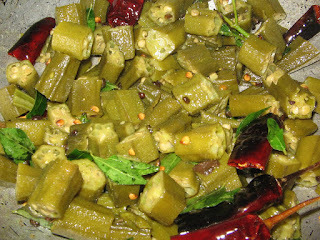 Usually children like this curry much as it wont be too hot or spicy.More over Okra a good food. Excellent. My mother's and my grand mother's recipe is also same as this. Thank you very much.